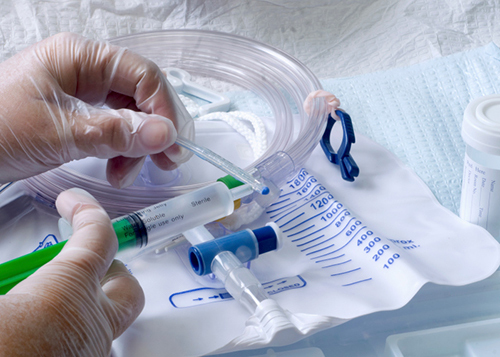 An arterial catheter is, simply, a thin tube that is inserted into an artery to draw blood. They are commonly used in intensive care and anesthetic medicine to monitor blood pressure and take samples of certain gas levels. Since the catheter is a direct line between the skin and the bloodstream, there is an obvious interest in keeping the device sterile. Unfortunately, as a recent Rhode Island survey shows, not all hospitals seem to have registered that last part. Researchers from Rhode Island Hospital sent out an anonymous web survey to various critical care physicians at six different teaching hospitals in the state. They were asked about how regularly physicians followed the 2011 Centers for Disease Control and Prevention (CDC) recommendations for sanitary arterial catheter insertion. These guidelines included elements like surgical gloves and masks being worn, a sterile drape being used at the insertion site, hands being washed beforehand, and the skin being prepared with an alcohol swab. They were also asked about the perceived likelihood of an arterial infection from catheter insertion as opposed to a central venous insertion, which uses one of the major arteries with more direct access to the heart. The CDC recommendations for arterial insertions are less stringent than those for venous insertion, although there is some recent evidence suggesting that the infection risk is similar between the two. What the researchers found is that only 44% of responding physicians reported using the CDC-recommended precautions, while only 15% reported using full barrier measures. When asked about the relative risk of infection between arterial and central venous insertions, 50% of non-surgeons felt there was comparable risk, while 33% of surgeons disagreed. Additionally, while 62% of non-surgeons supported mandatory full sterile procedure for arterial insertions, only 33% of surgeons did. While troubling that the survey revealed some hospitals did not properly follow CDC precautions, it is difficult to draw broader conclusions from the study. Due to non-responders, the sample size ended up being 27 physicians spread across six hospitals in a single state. No data was collected on the relative rates of infections at the surveyed hospitals either, so it is unclear whether the deficient practices resulted in catheter-caused infections. This last part is additionally important because, as the researchers note, there has been very little research done into the effectiveness of full barrier precautions for arterial insertions. Study researchers recommend further studies to both determine more optimal sterile procedures and to get a larger understanding of the arterial/venous risk comparison. Cohen, D., et al., “Insertion and Use of Arterial Catheters: A Survey of Clinician Antiseptic Technique,” Rhode Island Medical Journal 2014: 24–27; https://www.rimed.org/rimedicaljournal/2014/08/2014-08-24-cont-cohen.pdf, last accessed August 21, 2015. “RI Hospital researchers: US hospitals flout CDC recommendations that prevent infections,” EurekAlert! web site, August 20, 2015; http://www.eurekalert.org/pub_releases/2015-08/l-rhr082015.php.